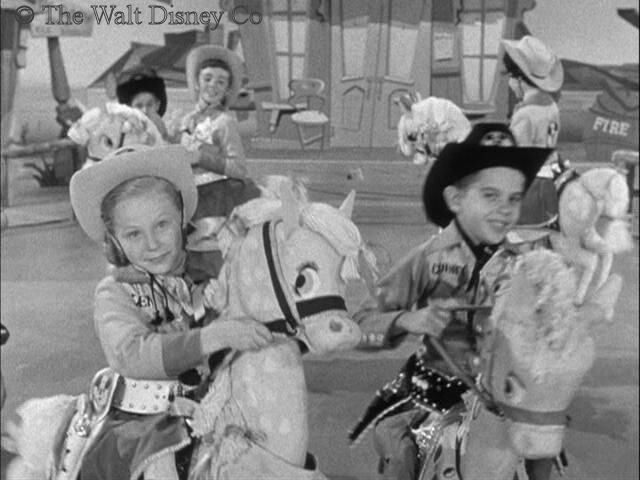 Every Friday the Mouseketeers would roundup outside performers, nearly always kids, to be that week's talent winners. 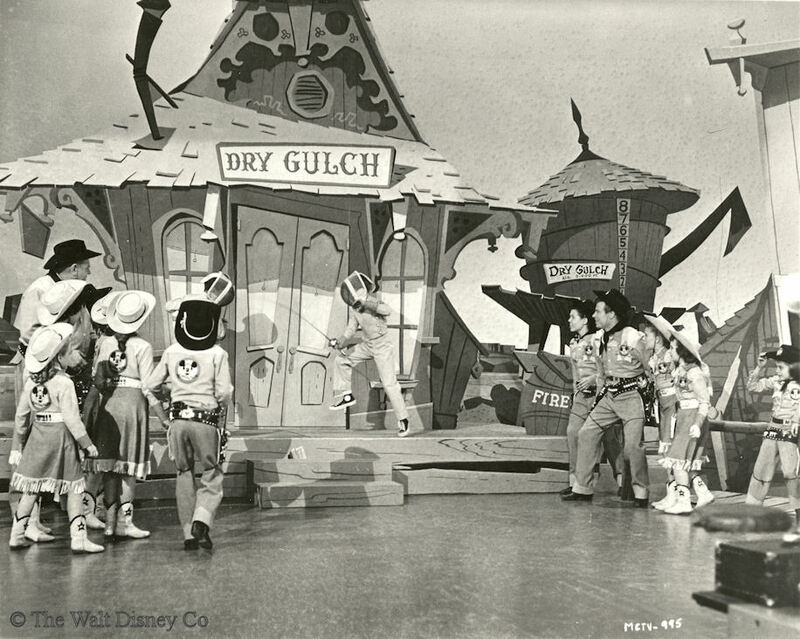 For both cast and audience this was a popular day, for the Mouseketeers often performed along with their guests. 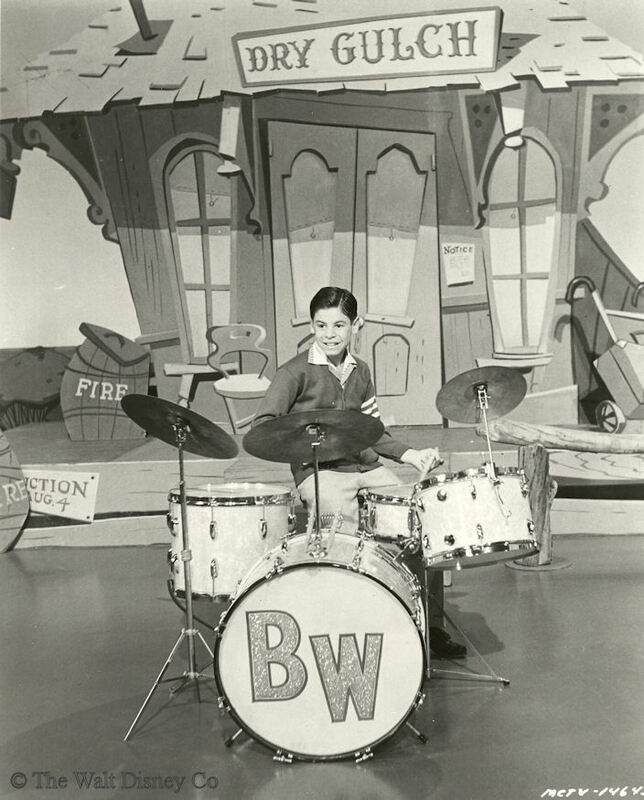 Winners were usually drawn from local and regional auditions, but some bypassed the competition and got the gig with a nod and wink to the producers. 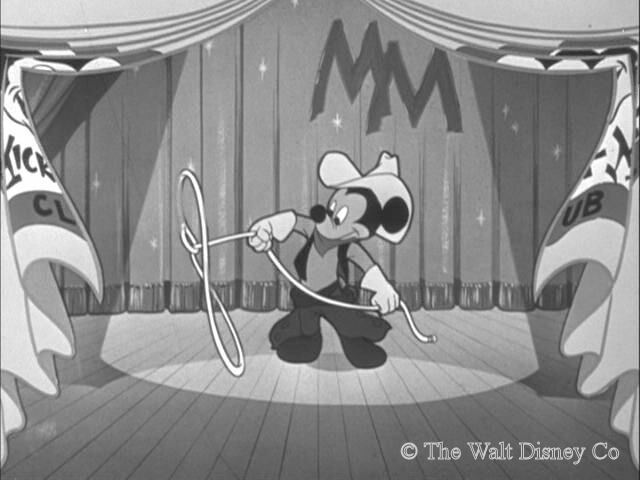 "Saddle your pony, here we go, down to the talent rodeo"
After the usual animated title song, Cowboy Mickey's daily intro has him twirling a rope over his head. 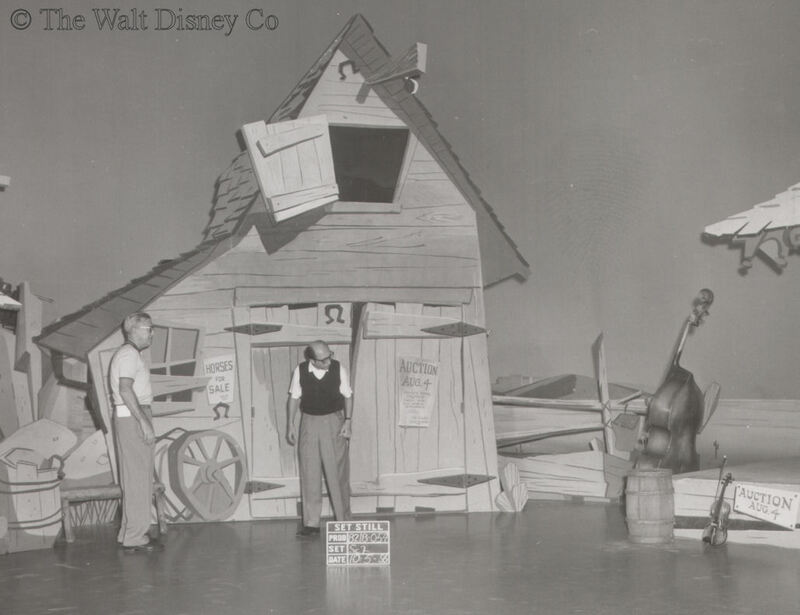 Letting it collapse around him, Mickey says "This here's our talent roundup day. You all pretty nigh ready? ", to which the Mouseketeers reply "Sho 'nuff". 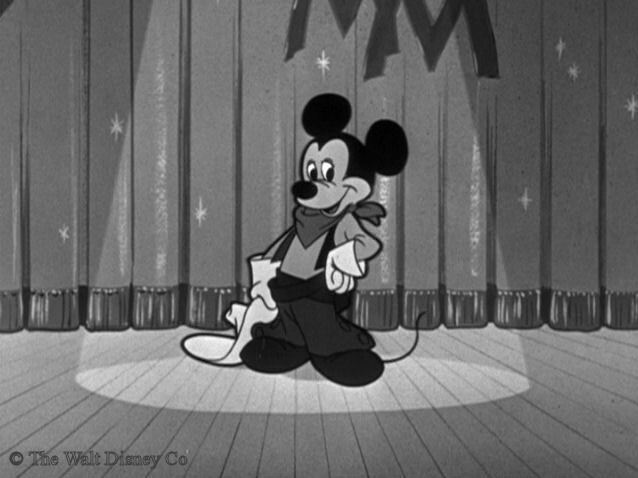 Mickey echoes their reply, pulls out his guns and blazes away "Then let the show begin!" For Friday, newsreel segments in the first two seasons featured regular or special newsreels. The former consisted of four to six short clips on various subjects, the latter was devoted to a single topic. 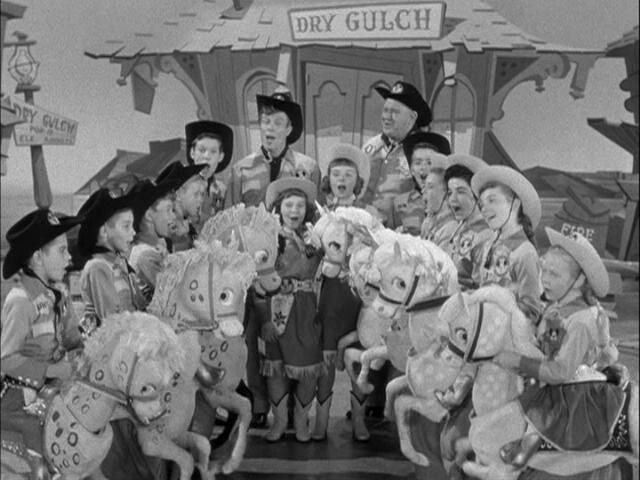 The half-hour shows of the third season eliminated this segment, and went right into the main feature. 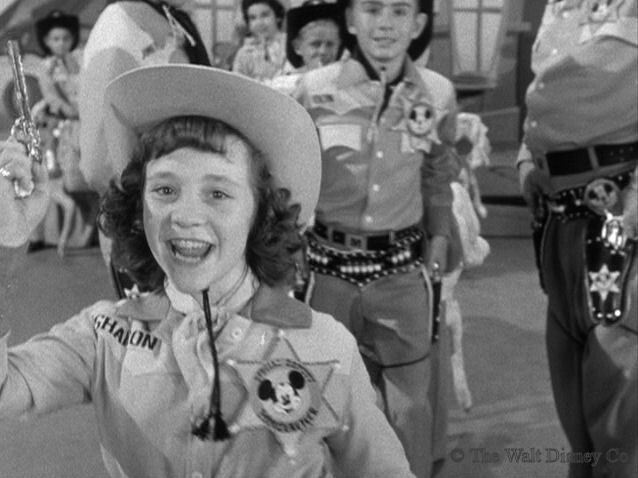 "Gather up Susie, Jack and Joe, join the talent roundup!" 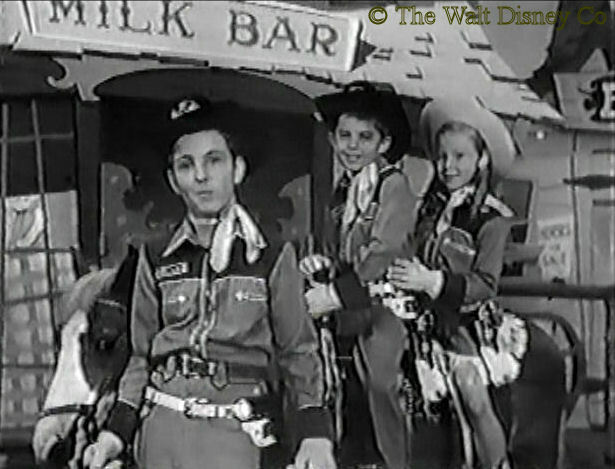 The Mouseketeer Segment started off with the day's special opening, filmed once per season using the Red Team, then recycled every Friday. 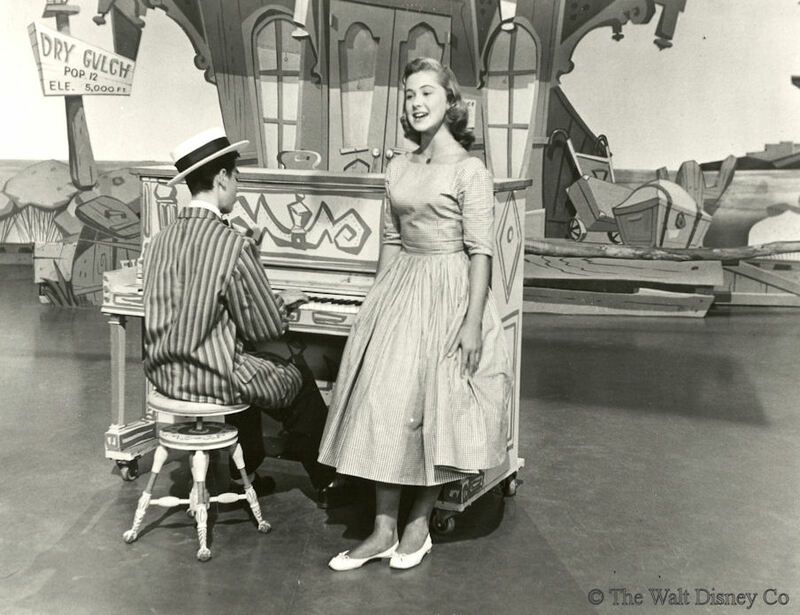 It began with the only daily opening song not written by Jimmie Dodd, Talent Roundup (by Gil George and George Bruns). 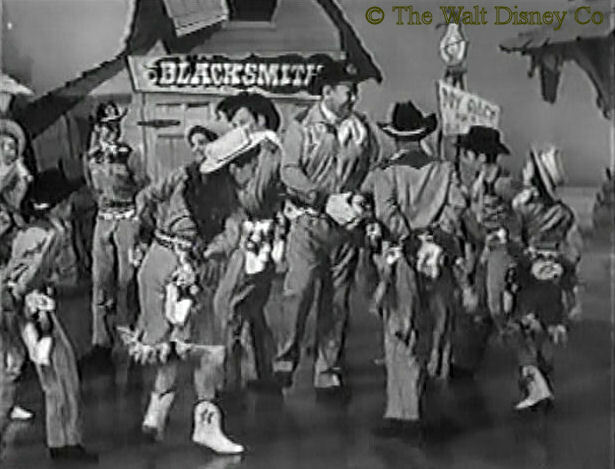 The first season opening appears to have been choreographed with both live and film performances in mind. It was simple and fairly short, and broke into three sections that could all be done in a single take. 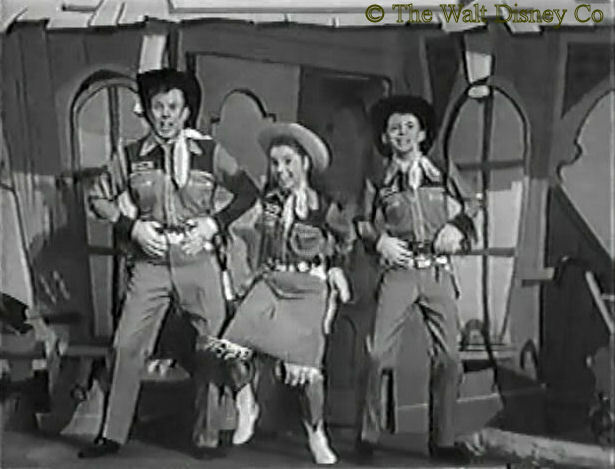 First Jimmie came out of the Dry Gulch train station singing, to be joined by Darlene and Mark, wearing prop "ponies". The three of them sang as they moved towards the camera, which pulled back the focus to show six younger kids with prop "ponies". 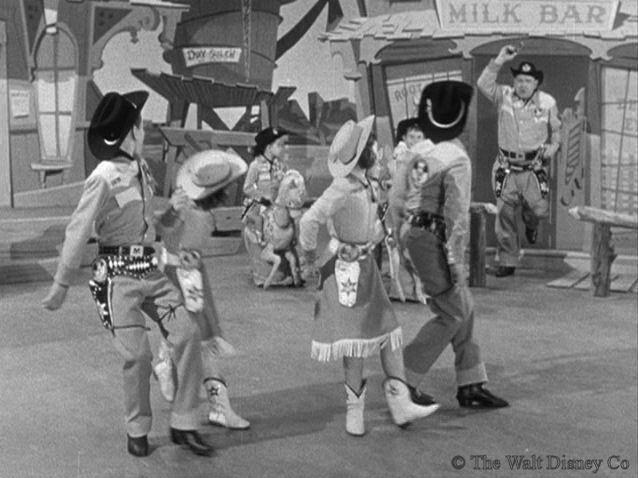 These six did a simple circular pattern to musical accompaniment, which climaxed with the train station doors again opening to divulge four of the older kids, who did a fast cowboy jig. 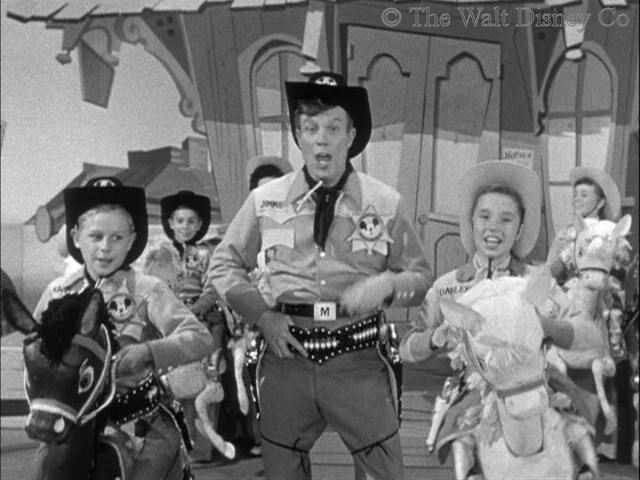 The performance ended with Roy firing his pistols as he came out of the Milk Bar announcing "Time for the Mouseketeer Roll Call". Simple it may have been, but it was also very popular with the viewing audience. For the second season the choreographer and director came up with a longer and more elaborate performance that required multiple camera angles and takes. 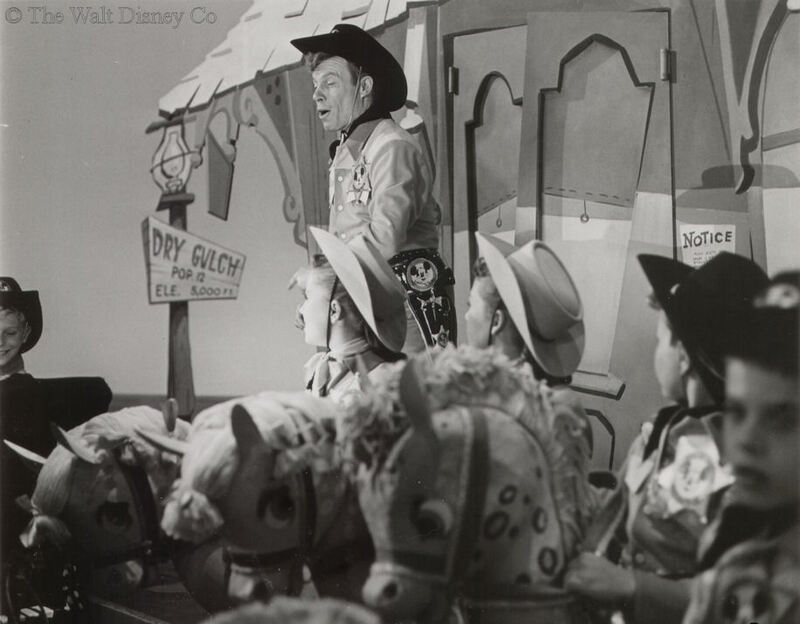 The Dry Gulch set itself was expanded with several new buildings and props, including a live pony and a stage coach belonging to the "Disneyland Stage Lines". 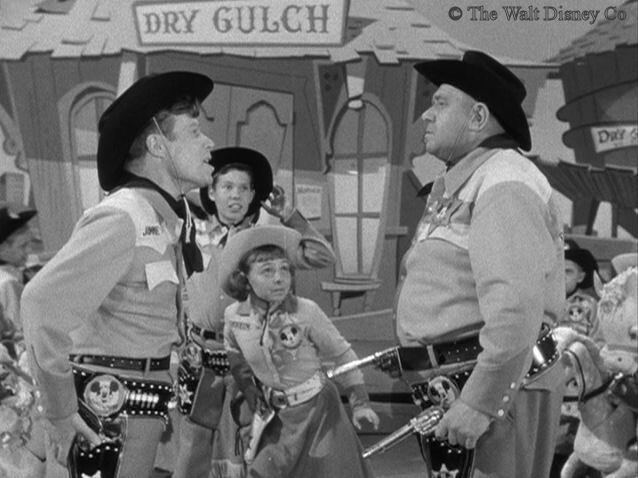 Talent Roundup was still the main song, but like the openings for other second season days, this had a "detachable" secondary number (built around Hi to You) that could be excised for reruns or syndication. 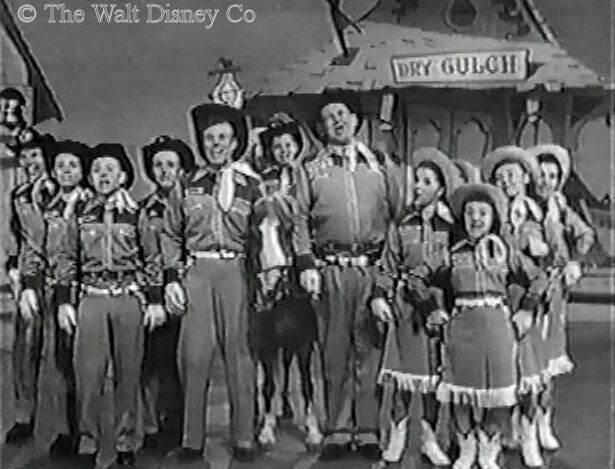 For the third season, the daily opening songs, dances, and roll call, were all replaced by the generic We're the Mouseketeers (see Fun With Music Day), though in a nod to this day's popularity, the mice wore their western outfits for the Friday opening, but not for the Alma Mater closing. 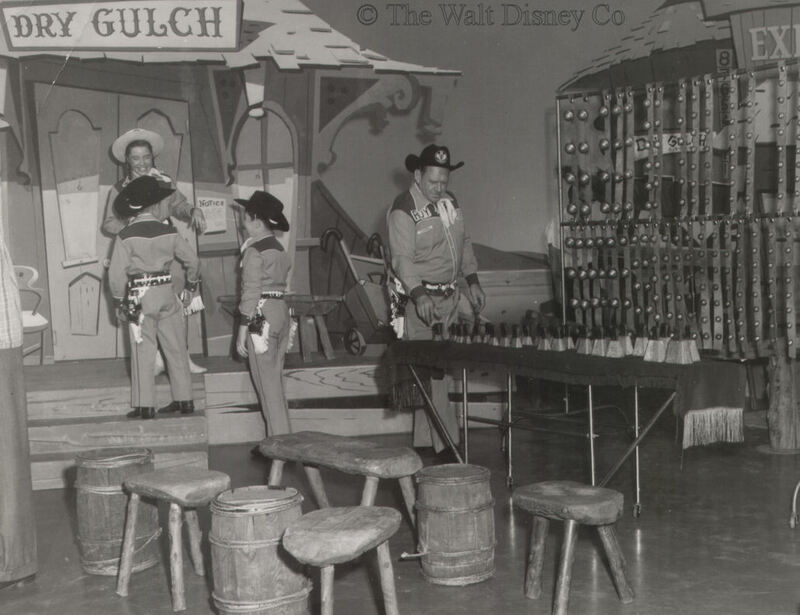 "Round 'em up, bring 'em in, everybody's sure to win!" The whole point of the Friday Mouseketeer segment was the Talent Winners themselves, of course. 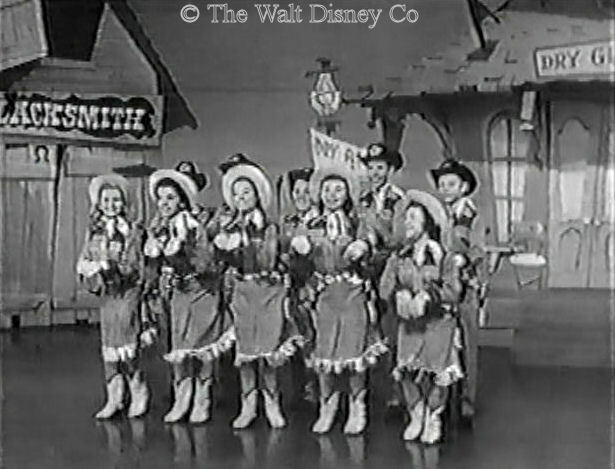 Some eighty different acts (not counting Mouseketeers) of from one to thirty performers each appeared during the show's three year run. 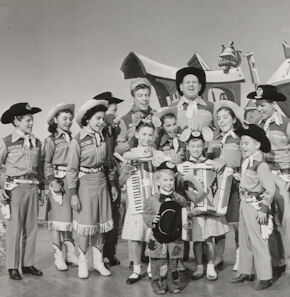 If Fun With Music Day was a teenage version of primetime musical variety, then Talent Roundup Day was the MMC equivalent of Ted Mack's Amateur Hour or similar fifties shows, with the exception being that only the winners appeared on camera. 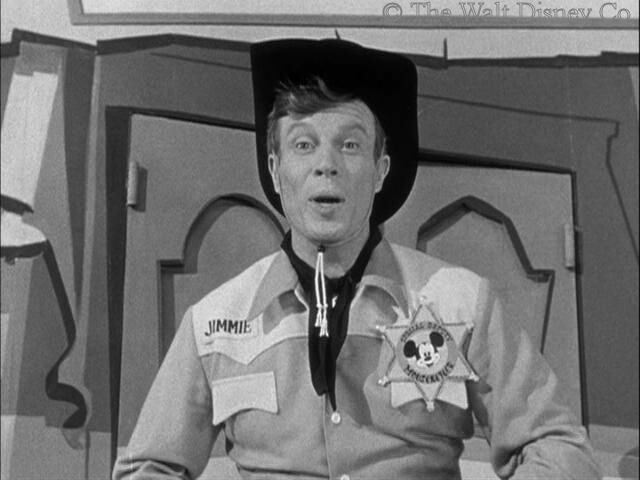 This was the only day of the week on which Jimmie Dodd always appeared. Other days could and did do without him, but his gentle manner was a necessary reassurance to amateur kids suddenly thrust into the baffling world of the film set. Jimmie also had a big say in selecting the winners, a chore he shared with Hal Adelquist for the first two seasons. 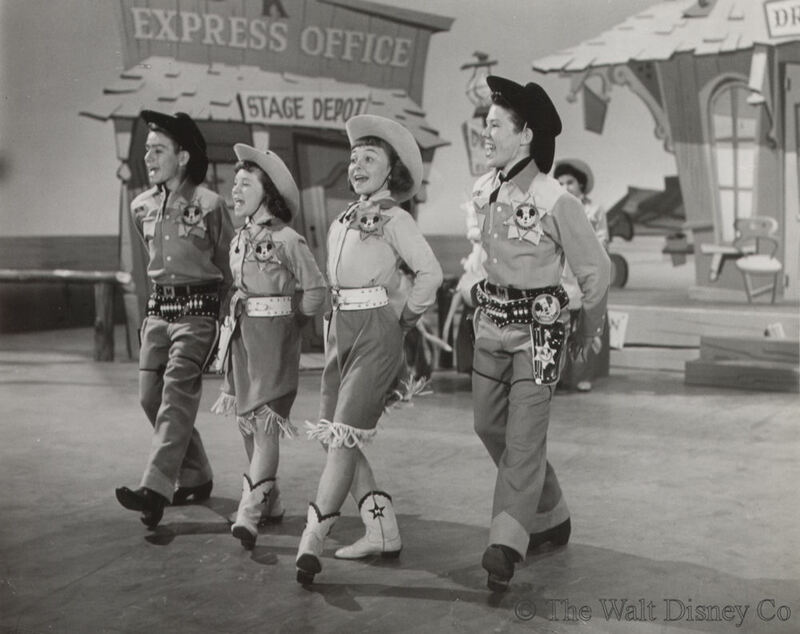 The original Mouseketeer open audition at the Burbank studio in April 1955 and the subsequent callbacks served as the recruiting ground for the first batch of talent winners. Not knowing exactly what would work well on television, Hal and Jimmie at first picked an eclectic mixture of acrobats, marginal athletes, and arcane instrumentalists to go along with the usual singers and dancers. Some of these acts, though interesting in themselves, didn't always work out well on camera. 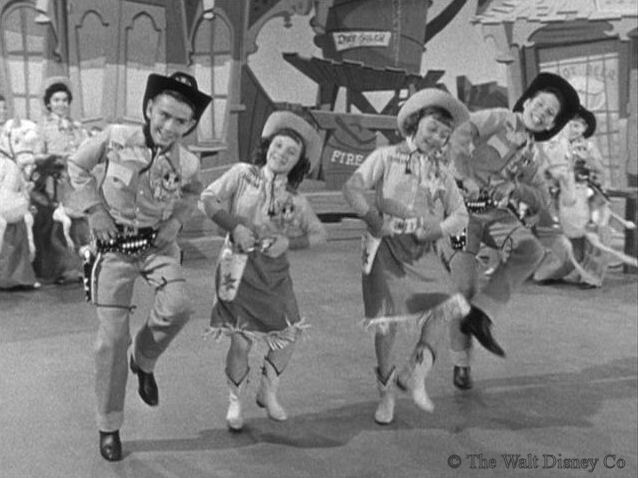 Other acts barely got a chance to perform; in a few shows the majority of time was taken up by Mouseketeers singing, dancing, and mugging for the camera. 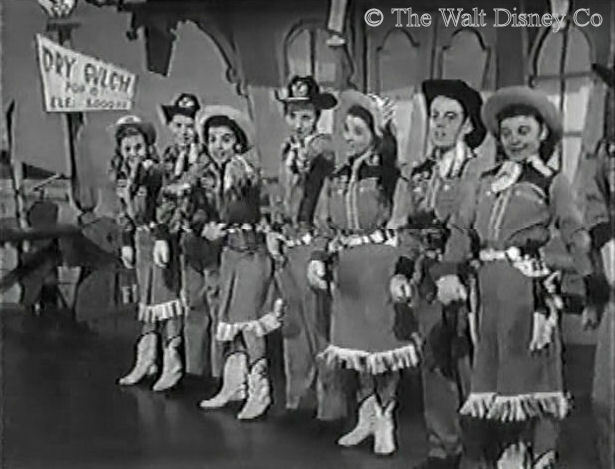 For the later seasons, however, musical variety acts dominated, which made it easier on the writers (all casual dialogue was scripted), and enabled the Mouseketeers to better prop up a slight performance. 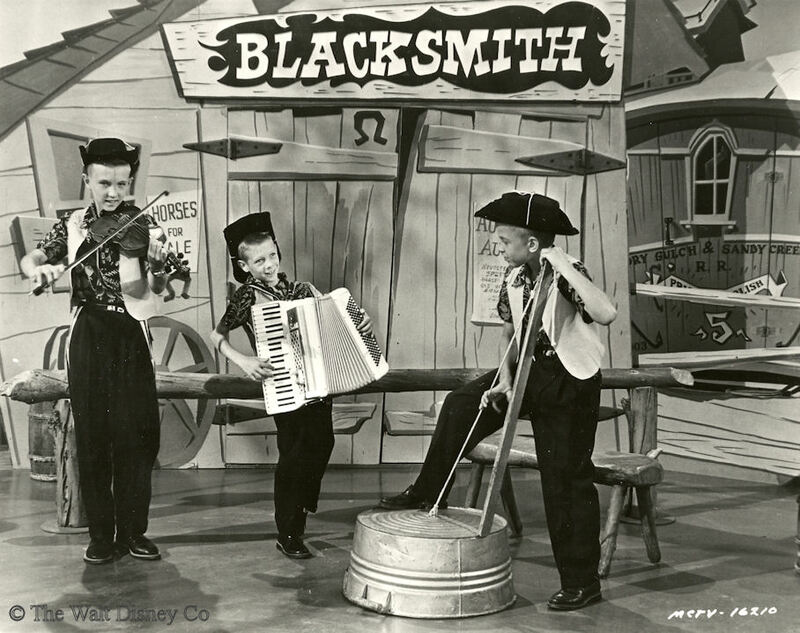 After the first year Talent auditions were kept separate from Mouseketeer selection. 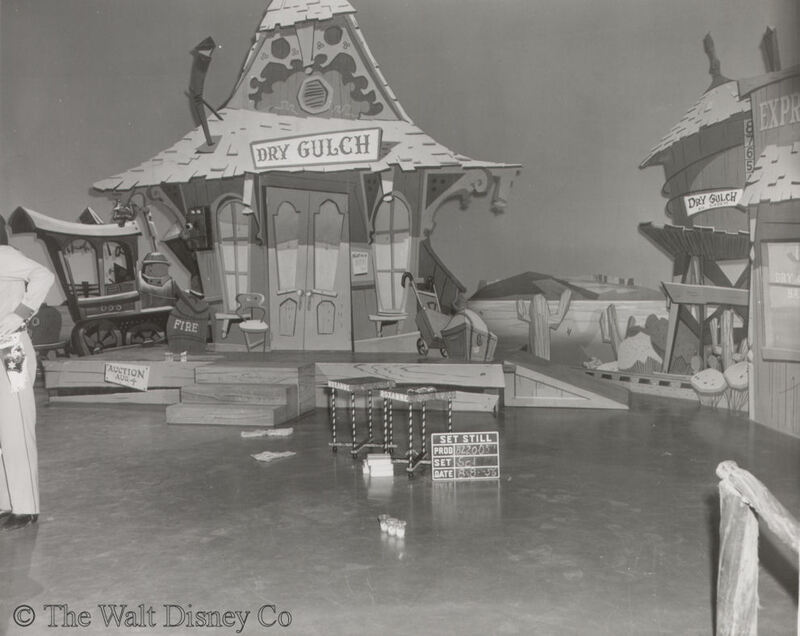 There were ten regional competitions held across the country during June to September 1956, with locally recruited judges and Disney casting agents making the initial selections, and the final winners chosen by Jimmie Dodd and Hal Adelquist. Winners from California still outnumbered everyone else, but there were also quite a few kids from New Jersey and the upper Mideast. 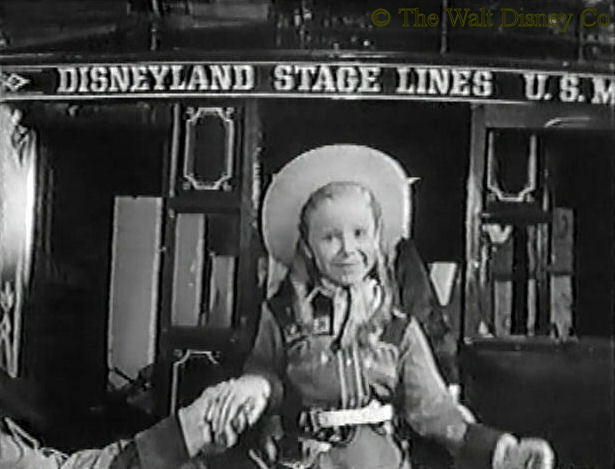 Only one talent finalist ever made the leap to Mouseketeer status, Bonnie Lynn Fields. Of course, there were a lot of folks who became talent winners without ever auditioning. 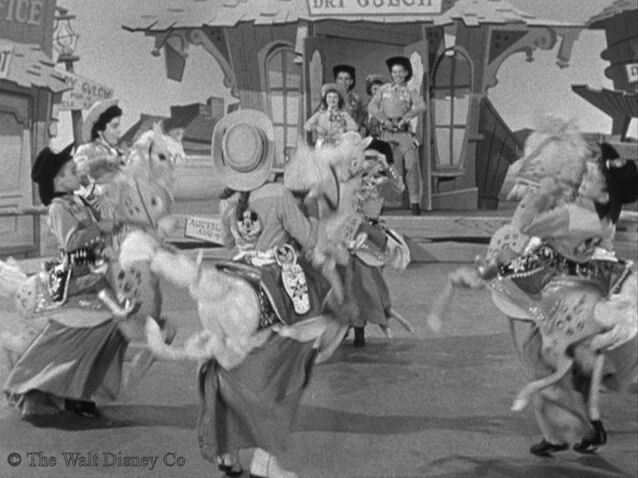 Actors Fess Parker and Buddy Ebsen, the Native American performers from Disneyland, Mouseketeers, Mouseketeer relatives and dancing partners, and ex-Mouseketeers were all on the fast track for the Friday show. Also likely bypassing the audition route were professional groups like the Lennon Sisters, the Covan Kids, and Hall Johnson's Singing Sprites. 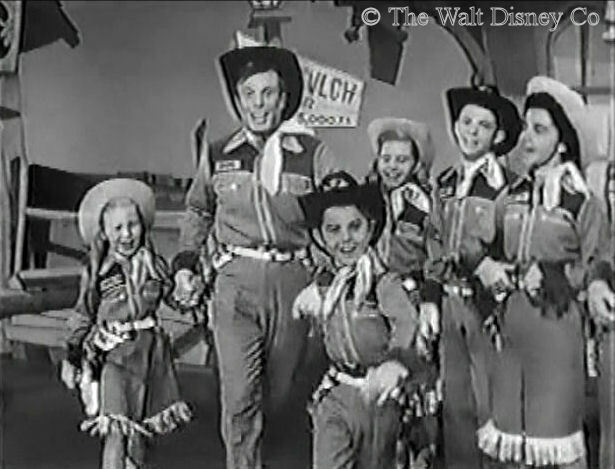 Talent Winners received $15 per day; most performances were filmed during California's summer school break so the winners seldom got to attend school with the Mouseketeers. Filming took several days, with multiple acts being shot during the same week though they might wind up on different broadcasts. Other perks were an airplane ride to California, a paid hotel stay, and free passes to Disneyland for the family. 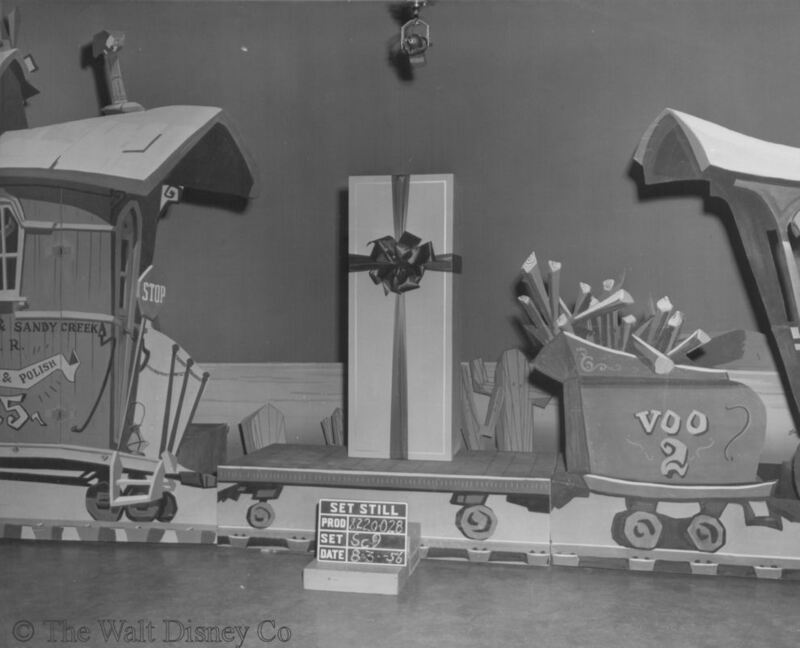 There was also the on-camera gifts of cowboy hat, ears, and in the first season, a "strongbox full of Mouseka-treasures". 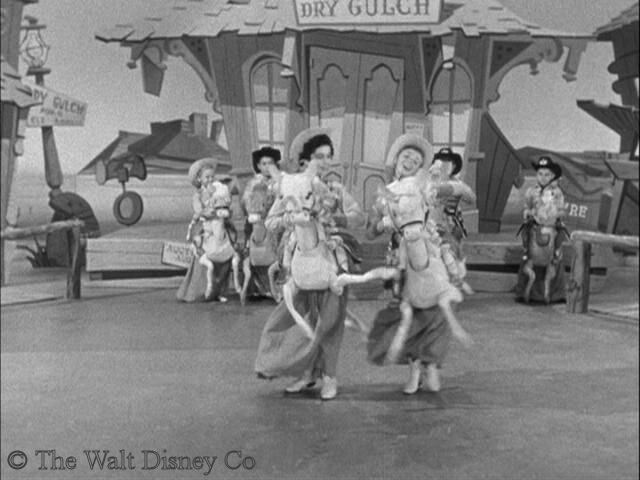 The hats were awarded with a little ritual jingle making the talent winners honarary Mouseketeers; the items seen on-camera were stage props with the actual gifts given later. The costs for all this were borne equally between the local sponsor and the Disney Studio, both sides ponying up $1200 for each talent winner. 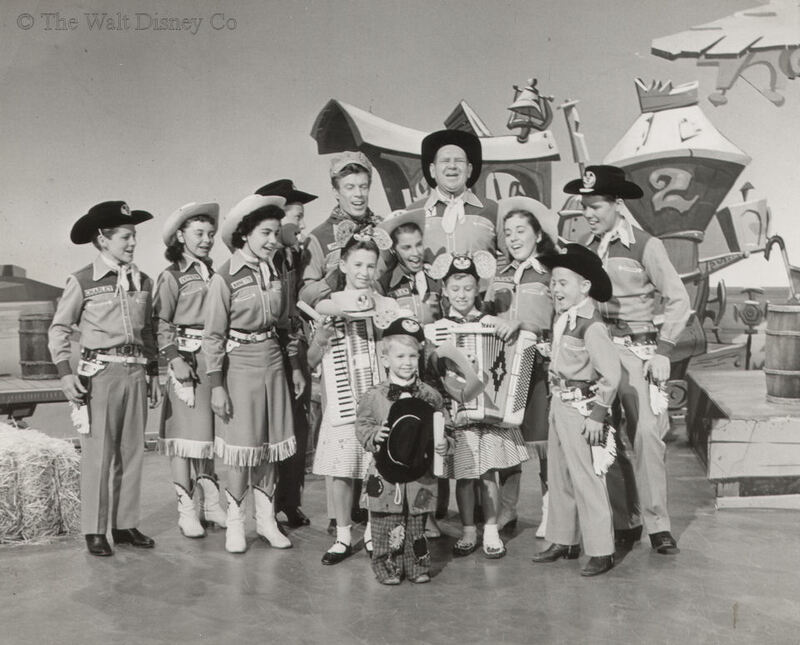 This was a lot of money in the 1950's, so its no wonder the studio chose to use locally-based professional acts and Mouseketeer friends and relatives for many Friday shows. "Step right up! Here we go! Oh, what a rodeo!" 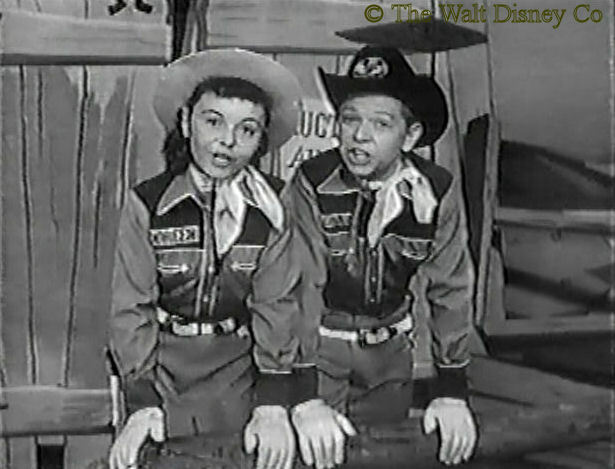 The Serial and Mousekartoon segments followed the Mouseketeer performance for the first two seasons. The serial episodes and cartoons differed every day, with no distinctions for day of the week. For the third season, only a serial would be shown in this time slot. After the cartoon there would be the usual features: Doddism and/or promotional message, then an Alma Mater variant. At the start of the first season Jimmie's closing messages usually announced the next day's show, but this was dropped midway through the year. 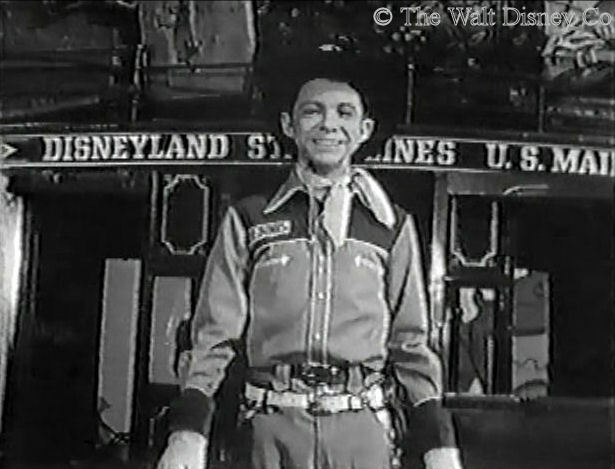 Mickey then reappeared for the signoff, saying "See ya'll next week".